Gamescaster is a front-end (graphical user interface) of open-source Framework "GLC". 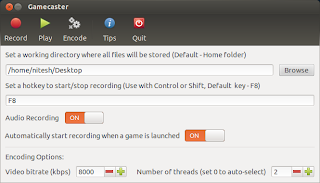 Gamecaster is able to record any games which uses ALSA for audio and OpenGL for drawing on the screen. The recorded video is in 'glc' format but Gamecaster can convert it into WebM format. 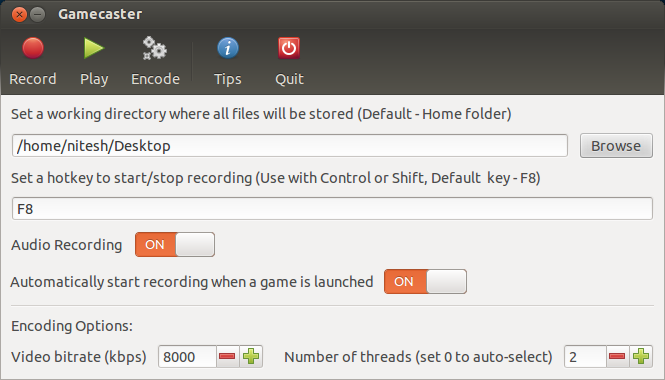 Gamecaster is created by Nitesh Gupta @ubuntuvibes.com. The application is still in alpha stage. So, don't expect too much and you might find many of bugs in it. If you want to report a bug or request a feature please refer to Gamecaster development page at Launchpad.